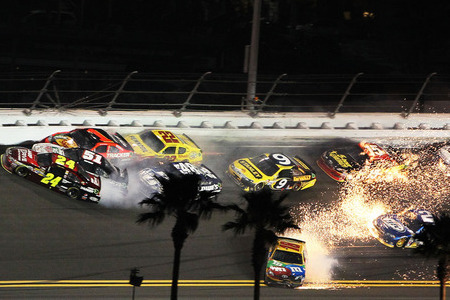 The 34th running of the Budweiser Shootout sparked the beginning of what is surely to be one hell of a 2012 NASCAR season. And a year after tandem racing, NASCAR finally gave the fans exactly what they’ve been missing….the triumphant return of Pack Racing. In changing things from length of the back bumpers to the openings of the grilles, NASCAR did everything they could to get racing back to the famous—and sometimes infamous—pack style racing. And it worked because this was one of the best Bud Shootouts I’ve ever seen. If any fan would have told me prior to the Shootout that the #18 M&Ms Camry driven by Kyle Busch would have been in victory lane I wouldn’t have taken you seriously. Especially after how badly the 2011 season had ended to Kyle Busch and his JGR team. Kyle and his team rallied from two spin saves which could have easily been wrecks, as well as having to start at the back of the field in a backup car — necessitated by a wreck in Friday’s practice — Busch won the season-opening exhibition race for the first time. His winning margin over Stewart was .013 seconds, the closest in Shootout history, in a green-white-checkered finish that took the race seven laps beyond its scheduled distance. Busch’s victory was the first in a NASCAR race car using electronic fuel injection, which was introduced to the Sprint Cup Series this season. But how did we get to such a photo finish? Stewart had just taken the lead on Lap 74 of a scheduled 75 when a violent wreck in Turn 4 sent Jeff Gordon’s No. 24 Chevrolet barrel-rolling through Turn 4 and sliding on its roof toward the entrance to pit road. Gordon was following Kyle Busch on the backstretch, and contact between the cars turned Busch’s Toyota onto the apron. Busch made a dramatic save for the second time in the race, but Gordon slid up the track into the Chevrolets of Kurt Busch and Jamie McMurray. As all three cars contacted the outside wall, Jimmie Johnson’s Chevrolet nosed beneath the right rear bumper of Gordon’s car and turned it upside down. The wreck left 11 cars on the lead lap and sent the race to overtime. “I had much more fun as a driver out there tonight,” said second place finisher, Stewart. “Definetly a lot more fun. You felt more eager and engaged than in the two-car draft. This is much better than sitting there and having to stare at a back of a spoiler for 500 miles.” I am sure that Tony has a sour taste in his mouth after losing out to Kyle Busch even if it’s just a money race. The pack racing is back and scarier than ever; thanks to Jeff Gordon we all know just how scary it can be. But, what a way to kick off Speed Week and the 2012 season! Fans, this is going to be one wild ride so I suggest that you pull those belts down tight and hold on! The Indy 500 Without Danica Patrick?